Why and when to use Custom Post Types? Once you installed your GD directory plugin, you will need to create categories before you can add any listings to your directory. The free GD plugin will automatically create a new custom type of WordPress posts, which allows you to add content to your directory. 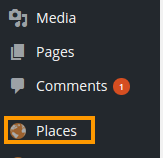 The GD plugin calls these custom posts Places, and you will find them in the main WP admin menu. In the GeoDirectory context, these posts are called listings. Every listing will need to be in a category, or the listing will not be added to the GD maps. The above examples are based an the standard free GD plugin installation: All your listings and categories will need to be of the same custom post type Places. The Custom Post Types Addon (CPT) lets you add as many CPTs as you need. As standard, GeoDirectory comes with one CPT called Places (see above), new CPTs will have their own dedicated sidebar menu and management system just like Places. The advantages of this plugin are that instead of trying to manage a large diverse directory with many categories all under the one post type, you can split these into more manageable CPTs. Some widgets can only be filtered on one CPT at the time. Maps can only show one CPT at the time but can show multiple categories at the same time. 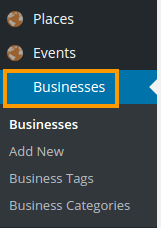 The Events Addon is a custom post type specifically designed for the way events are prioritized by dates. With this plugin you can let users add their events to your site. Events are ordered by upcoming date by default. Users can enter recurring dates for their events instead of having to create lots of separate events. As this is also a custom post type you have the usual ability to add custom fields and sort options.